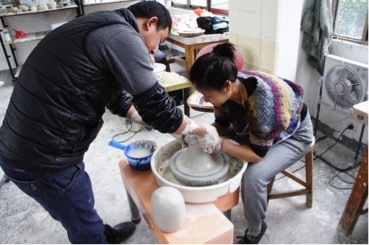 The entire city of Jingdezhen revolves around its clay production, and its entire clay production revolves around Kaolin - the main ingredient that gives porcelain its translucence quality. 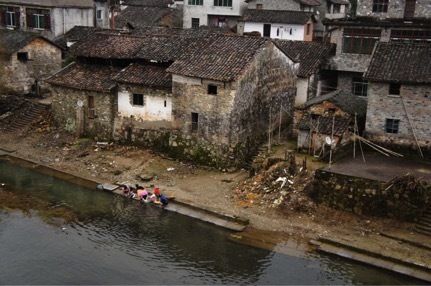 Jingdezhen is known as the porcelain capital of the world, as Kaolin was first discovered there. Less than a decade ago, super-white porcelain and middle-white porcelain were the only clays available in Jingdezhen. Every glaze and kiln are designed and built specifically for these two types of porcelains. 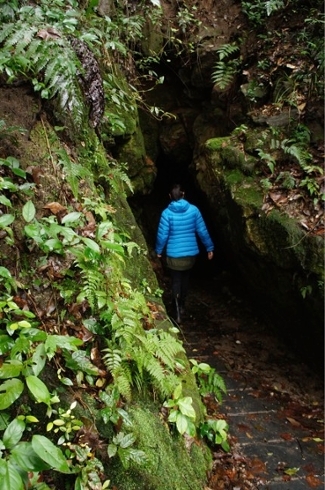 As such, the entire clay process is wildly different from the Western method of production. How different can the processes be you ask? Well, if you find yourself in need of ten plaster molds in a day, there’s no need to panic and lock yourself in the studio all day. There are 5 teams of mold makers ready to assist you in TSF. If you’re used to bisque-firing your pots before glazing them, well, adapt quickly because ain’t nobody got time for that in Jingdezhen. Hire a glaze man to glaze your green-ware and let the kiln man take care of the rest. Oh, and most importantly, use less water! This mistake led to an abundance of cracked greenware, and I wish I had known it earlier. Let me just say that this place blew my mind. 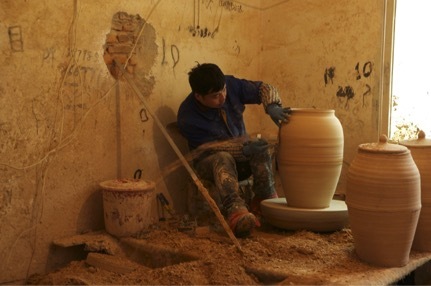 Lao Chang is a hub of hardworking craftsmen who throw, trim, paint, glaze and fire pots for production. Every thrower or trimmer I watched hypnotized me with their amazing skills. It was simply impossible to take my eyes off of their wheel once they started a piece. For the pot that’s being worked on in the photo, the thrower probably had to move 50 pounds of clay on the wheel, working against centripetal force, just to shape the bottom half of that vessel. Oh, and it would only take him less than 5 minutes to throw it. The apprentice would then bring the piece to the outside drying area, while the thrower threw the upper half of the vessel. He would have to eyeball the opening of the pot to make sure it fits with the bottom half of the vessel. Notice the untrimmed pot in front of the trimmer in the photo. In the photo, the trimmer is trimming away rough edges, reshaping the form of the pot after he had attached the two halves of the vessel - another 5-minute job for the professionals. Taking classes with the local masters in throwing, blue and white painting, and carving was a central part of our residency. Without learning the Chinese ways of working with the local porcelain, it would’ve been a much rougher path transitioning from working with stoneware to porcelain. In the above photo Master Hu was teaching me his method of wheel wedging (aligning clay particles in a vertical spiral on the wheel) with super-white. His first comments on my throwing techniques when we first met were, “you have no strength,” followed by a long pause, “but that’s okay, you don’t need strength with my method.” And to my surprise, as Master Hu lightly guided my hands with his, I was suddenly moving 10 pounds of clay almost effortlessly. For the first time in my life, throwing with porcelain was not stressful anymore. My throwing technique continued to improve over the course of the next three weeks. Over time, I was able to throw at a larger scale, with thinner walls, and most noticeably, with more control over the forms of my pieces. 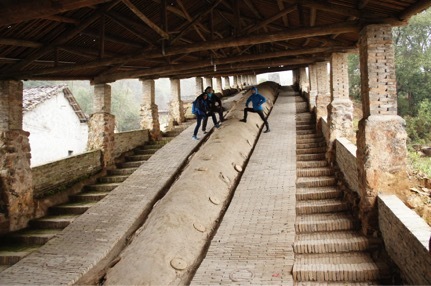 Josh, Alberto and I on top of the Dragon Kiln built during the Qing Dynasty. The wood-fired kiln currently fires once a year. Architecture from the Qing Dynasty near Yaoli.